Israel is suspected of possessing nuclear weapons although it has neither confirmed nor refuted the rumors. However, in light of recent research several scholars have suggested that Israel has indeed created its own nuclear bomb. Speculations about the origin of a mysterious "double flash" witnessed in 1979 by the US "Vela" satellite in the Indian Ocean have finally been put to rest as an international group of researchers published their analysis of Australian sheep thyroid organs in the journal Science & Global Security. 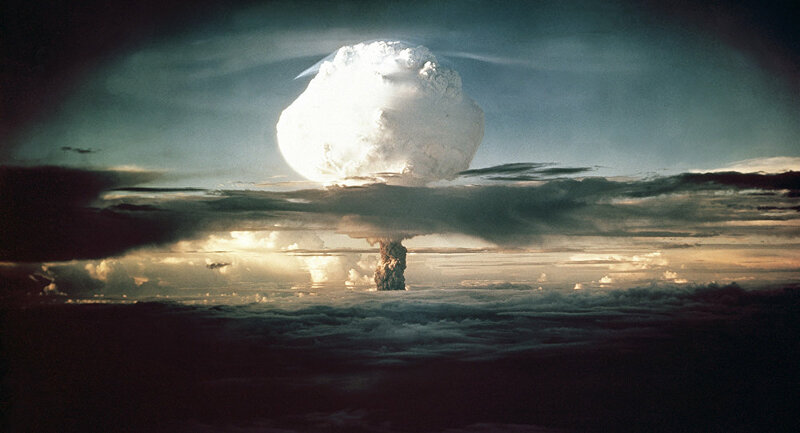 Their research left no doubt that the flash was nothing else but a nuclear explosion, most likely an atmospheric test. According to the paper, the sheep that grazed in areas hit by rain four days after the incident had traces of iodine-131 in their thyroids. Researchers point out that the wind pattern suggests that the fallout from the test site was carried from Prince Edward Islands in the Indian Ocean to Australia. The study says that along with visual pictures from the satellite and hydroacoustic signals from underwater listening devices there is strong evidence that the Vela incident was an illegal nuclear weapons test. Thyroid samples from Australian sheep were collected and sent monthly to the US in 1979, but the information on the test results was revealed only recently under the Freedom of Information Act. "By 1979, it had long been established that thyroid glands of grazing animals, and especially sheep, efficiently concentrate radioactive iodine-131 from atmospheric nuclear weapon tests," the paper says. Health researcher Professor Nick Wilson of Otago University in Wellington said in a comment for New Zealand Herald that the research strengthens the evidence that the Vela incident was a nuclear weapons test "very likely to have been conducted by Israel with assistance from […] South Africa." Nuclear weapons expert Leonard Weiss of Stanford University, in an interview with the Bulletin of the Atomic Scientists said that there is "growing circumstantial evidence" regarding Tel Aviv's connection to the incident. "Israel was the only country that had the technical ability and policy motivation to carry out such a clandestine test," Weiss said. Israel's Ambassador to New Zealand, Itzhak Gerberg refuted allegations regarding Israel conducting an illegal nuclear weapons test in the Indian Ocean and said that they "hold no water." Israel has never denied or confirmed the widespread rumors that the Jewish state possesses a nuclear arsenal. Back in December 2013, former speaker of the Knesset Avraham Burg claimed Israel had nuclear armaments in its possession during a press conference on denuclearizing the Middle East.